Many webmasters, website publishers, podcasters and bloggers make use of FeedBurner to manage and provide custom RSS or Atom feeds. FeedBurner, in turn, gives publishers important traffic analysis such as number of subscribers, reach (people who take action to view or click), feed readers and aggregators, popular feed item, item use and uncommon uses. FeedBurner also allows publishers to set up email subscriptions and participate in Google AdSense for Feed advertising program to earn revenue. To give web publishers more detailed tracking information on the feed, FeedBurner has introduced a feature which allow FeedBurner feed to report feed clicks in Google Analytics. By tracking feed clicks on FeedBurner, publishers can track and view traffic activity, that is originated from feed items clicking in the “Traffic Sources” reporting section of Google Analytics, with information such as distribution channel (feed or email subscription) and endpoint (application where a click request originates). The only problem is that when FeedBurner is tracking item clicks as traffic source in Google Analytics, it will append and tag the feed item URLs with Google Analtyics tags such as “utm_source” and “utm_medium” as query string, when click-through from the feed URL such as http://feedproxy.google.com/~r/FeedForMyDigitalLife/~x/xxxxxxxx/. The addition of Google Analytics tracking code to the website’s URL (link location) when visitors click on a FeedBurner feed item can break some web pages, especially if the web app is interpreting and parsing the question mark in the URL as the beginning of query string. There is other potential issue too, such as when robots.txt been used to stop and prevent bot crawling on URLs that contains special characters like “?”. Go to the feed that user wants to turn off and disable the Google Analytics clicks tracking by clicking on its Feed Title. Navigate to the Analyze tab. 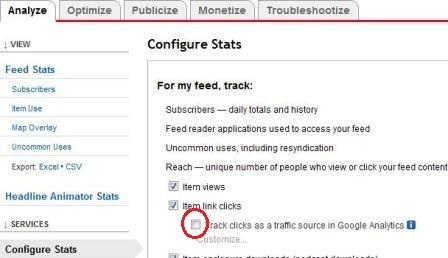 Unselect (untick) the checkbox for Track clicks as a traffic source in Google Analytics option. Click on Save to make the change permanent.